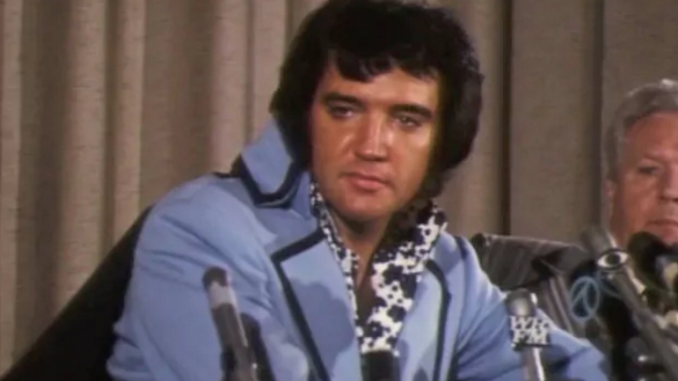 In this case, the publisher of an audio magazine, which was to include a recording of Elvis’ 1972 Madison Square Garden Press Conference is seeking declaratory and injunctive relief against RCA, which has an exclusive contract with Elvis regarding recordings of his performances. RCA applied for a temporary injunction preventing plaintiffs from publishing the audio content. 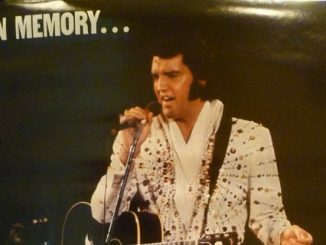 The Supreme Court (which, in New York state is not the highest court in the state) held that contract giving RCA the right to reproduce Elvis’ performances did not include a property right in any press conferences given by Elvis. The Court also held the conference was a newsworthy event that protected Current Audio against RCA’s claim concerning any right of publicity vested in the recording. Thus, RCA’s motion was denied and Current Audio’s application was granted. From my reading of this, the Judge had was pretty vehement in his ruling against RCA! You can see a video of this press conference below the court opinion. RCA CORPORATION (sued herein under its former name, Radio Corporation of America), Defendant. Emil, Kobrin, Klein & Garbus (Martin Garbus and Jack Dashosh of counsel), for plaintiffs. Cahill, Gordon, Sonnett, Reindel & Ohl (David R. Hyde, Roger S. Fine and Miles M. Tepper of counsel), for defendant. This application by defendant RCA Corporation for a temporary injunction stems from a press conference held by the popular singer Elvis Presley on June 9, 1972, shortly before his much vaunted appearances in a series of concerts at Madison Square Garden. 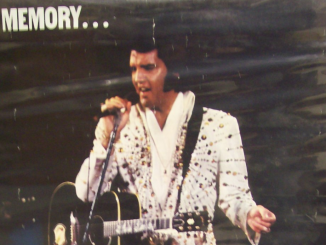 Defendant, who participated in the arrangements for the press conference, alleges that it has an agreement with Presley which provides, inter alia, that ‘a) RCA would have the exclusive right to manufacture and sell recordings made by Elvis Presley, and b) RCA would have the exclusive right to use Elvis Presley’s name, facsimile signature and likeness and biographical material for advertising and purposes of trade, in connection with all recordings made by Elvis Presley’. The press conference was attended by representatives of all communications media including radio, television, newspapers, magazines and numerous other publications of all varieties. The interview followed the usual pattern of questions being put to Presley by various of the media representatives followed by his spontaneous responses thereto. The conference was recorded on audio tape by many of those in attendance and also was recorded on film by the television people for later replay. Among those in attendance who taped the proceedings was a full time news reporter for a local radio station who was also employed part time by various other news organizations including the plaintiff Current Audio, Inc., the publisher of Current Audio Magazine, which is described in its advertising material as ‘the magazine you listen to’. The format of Current Audio Magazine, which is imminently scheduled to make its debut with ‘Vol. 1, No. 1’, has aptly been described as a ‘mixed medium’ in that it combines the sort of written material that can be found in certain types of magazines with a stereo record which includes interviews, commentaries, and other material which supplements and expands upon the written and photographic contents. The back cover consists entirely of a picture of ‘Elvis’ facing a barrage of microphones and again refers to ‘His first and only Press Conference.’ In addition to printed and photographic material on the inside of the cover relating to various of the aforementioned personalities, there is also included an 8 page insert containing other written and pictorial matter including pieces on Bella Abzug and the comedian Robert Klein, excerpts and a quiz from a book entitled ‘Discovery of Sexual Personality’ and articles relating to drug problems and crime, and a ‘Consumer Report’ dealing with a Nader report in conjunction with a particular automobile recall. The insert additionally includes the details of features scheduled to appear in ‘Future Issues’ as well as an explicit table of the contents of both sides of the stereo record which is also included in the cover. The record has a total playing time of approximately 45 minutes and contains interviews and comments by and about all of the persons and topics covered in the written sections including a 2 1/2 minute segment of actual excerpts from the Presley press conference. It is this partial reproduction of Presley’s participation in the press conference, together with the accompanying use of his name and photograph in the printed material that are the subject of the instant controversy. It is defendant’s position that the product created by plaintiff Current Audio, Inc., and to be distributed by the plaintiff Buddah Records, Inc., is nothing more than a recording and that its inclusion of the press interview of Presley and the accompanying photographic and other material relevant thereto constitutes an infringement upon the exclusive rights to such material which belong to defendant by virtue of its agreement with Presley. 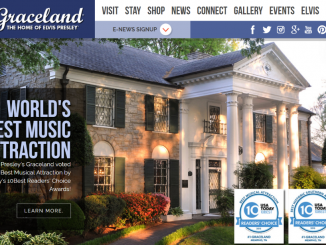 It emphasizes in that regard its great financial expenditures during the past 17 years in advertising and promoting the records of Presley to the end that he has become one of the leading and most successful recording artists in the United States and it also contends that plaintiffs’ product will directly and unfairly compete with record albums released by defendant, specifically an album entitled ‘Elvis Presley As Recorded Live at Madison Square Garden’, which as its name connotes is a recording of Presley’s actual performance, and also a record entitled ‘Elvis Sails’ which is a reproduction of a press interview held by Presley some years ago when he entered the service. By reason of all the foregoing, defendant asserts that it will suffer immediate, substantial and irreparable injury to its exclusive property rights in the recordings of Elvis Presley, to its substantial investment in him and to its reputation and goodwill unless a temporary injunction is issued forthwith enjoining plaintiffs from manufacturing, producing, distributing, promoting, or selling any phonograph records, tape recordings or other mechanical reproductions of Presley’s voice. Defendant has wholly failed to sustain its burden in that regard. It predicates its right to relief upon two grounds. First, it contends that ‘under the law of New York, one who performs a musical or dramatic composition has a property right in the oratory or artistic performance which is distinct from the copyright of the speech, music or literature itself’ and that ‘such right survives the broadcast of the performance or the delivery of the speech and misappropriation of the right by recording or broadcasting the speech or artistic performance will be enjoined by a court of equity.’ Without any extended discussion as to whether or not such is in fact an accurate enunciation of presently prevailing law, it will suffice to note that even assuming the legal accuracy of such proposition it is wholly without relevance to the undisputed facts in this case. Defendant’s strained contention that the answers given by Presley did not constitute ‘a general publication’ is ludicrous on its face in light of the open invitation to and presence of representatives from every conceivable area of the mass media, and the subsequent, uncomplained of, unlimited transmittal of the conference, including Presley’s voice, over both radio and television. Finally, it must be noted that the assertion of defendant’s alleged ‘property right’ in Presley’s participation in the conference is predicated upon its contractual arrangement with Presley. However, based upon a reading of that portion of the contract which is appended to its papers, it appears that defendant’s exclusive recording rights do not cover every utterance by Presley, and indeed it is questionable whether any such broad covenant could in any event be sustained (see Bizarre Productions v. Joseph Cates, 70 Civ. 5480, U.S.Dist.Ct., So. Dist. of N.Y.), but rather relate to ‘any performance’ rendered by Presley. 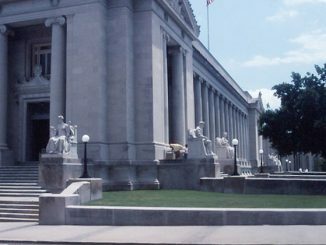 In this instance, as already noted, Presley was not in fact engaged in the performance of his art but was engaged in a public non- artistic use of his speaking voice, to which defendant was given no property rights under the contract. Thus, aside from the basic infirmities in defendant’s arguments with respect to the character of Presley’s participation in the press conference and his lack of any property rights emanating therefrom, defendant would in any event lack standing to itself enforce any such alleged property right because it was given no rights under the contract with respect to Presley’s appearance in such context. Thus, despite any contractual arrangements to the contrary, a person has no right to enjoin publications of factual or truthful biographical material about his life (see Spahn v. Messner, 18 N.Y.2d 324, 274 N.Y.S.2d 877, 221 N.E.2d 543; Rosemont Enterprises, Inc. v. Random House, supra), or of any other newsworthy events concerning him see Time, Inc. v. Hill, 385 U.S. 374, 87 S.Ct. 534, 17 L.Ed.2d 456. The scope of the subject matter which falls within the protected area of the ‘newsworthy’ or of ‘public interest’ extends far beyond the dissemination of news in the sense of current events and includes all types of factual, educational and historical data, or even entertainment and amusement, concerning interesting phases of human activity in general. (See Gautier v. Pro-Football, Inc., 278 App.Div. 431, 106 N.Y.S.2d 553, affd. 304 N.Y. 354, 107 N.E.2d 485; Goelet v. Confidential, Inc., 5 A.D.2d 226, 171 N.Y.S.2d 223; Paulsen v. Personality Posters, Inc., 59 Misc.2d 444, 299 N.Y.S.2d 501.) That a press conference of a popular and prominent singing star falls within this broad definition of ‘the newsworthy’ is self-evident. While the medium for dissemination of the newsworthy to which privileged status was first accorded was that of the printed word, the courts have been equally liberal in progressively expanding the ambit of protection to cover whatever news media have emerged. Thus newsreels, motion pictures, radio and television have all been held to be constitutionally protected with respect to the free dissemination of thoughts, ideas, newsworthy events and matters of public interest. (See Gautier v. Pro-Football, supra; Dallesandro v. Holt Co., 4 A.D.2d 470, 166 N.Y.S.2d 805.) It is apparent, moreover, that should man’s creative talent continue to develop new means of communication, the law will further expand to cloak such with protective status. It is not the precise mechanics of the medium that is of prime significance; the crucial factor is that the particular medium be designed to disseminate the newsworthy or matters of public interest. Whether plaintiff’s medium be continued simply as a magazine or some hybrid medium, it is clear that it is deserving of constitutional protection as a vehicle designed to communicate material which comes within the broad arena of what is considered newsworthy and of public interest. It is apparently defendant’s contention that plaintiff’s ‘magazine’ is no such thing but is simply a record and, as such, is deserving of no greater protection than a commodity such as chewing gum, and that the use of plaintiff’s name, picture and voice in the merchandising of such ‘commodity’ is a violation of his ‘right of publicity’. Such argument is wholly untenable. While the plaintiff’s product evidences many of the properties commonly associated with a magazine, and could properly be denominated as such, thereby concededly coming within the protected sphere of communications media, the precise labeling of the entity is not of major significance. What is critically determinative is the fact that, notwithstanding its creative and novel format, it is a medium both by way of the printed and the spoken word which disseminates and communicates information of newsworthy events of varied scope and matters of human interest. As such, it is entitled to broad protection and its right to freely communicate the newsworthy must supersede any private pecuniary considerations. (See Paulsen v. Personality Posters, supra.) That records are sold for profit can no more affect the protected status to which this ‘talking magazine’ is entitled than does such fact in connection with newspapers, books, movies, radio and television. The record which is part of plaintiffs’ publication is as much involved in the dissemination of information and matters of public interest as are these other recognized media and, as such, entitled to equivalent protection. Despite some intimations to the contrary in defendant’s papers, even a casual perusal of the publication, with respect to the extent to which the Presley press conference excerpts are incorporated into the record and the manner in which his photograph and name are presented in the written portions, demonstrates that there is no attempt whatever here to ‘palm off’ this record as that of Elvis Presley performing. 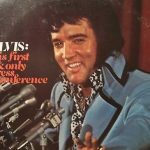 The format, while in certain ways superficially akin to a record album, makes clear that it is an informative ‘magazine’ carrying stories of current interest, together with accompanying spoken material, by and about various personalities and topics, and not merely by Elvis Presley. Defendant having wholly failed to establish any right to the temporary injunctive relief sought, its motion is in all respects denied. Plaintiffs have also moved herein for declaratory and injunctive relief. In light of the Court’s conclusions, upon essentially undisputed facts, with respect to the failure of defendant to demonstrate any property rights in the recorded remarks of Elvis Presley at the press conference of June 9, 1972, and its further findings that such press conference was newsworthy and constituted a matter of public interest and that plaintiffs’ ‘talking magazine’ Current Audio Magazine is a medium of communication subject to constitutional safeguard, it appears that a final disposition of this matter is presently possible. Accordingly, plaintiffs’ application for declaratory and other relief is granted to the extent of declaring that plaintiffs may publish, distribute and sell ‘Vol. 1, No. 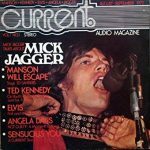 1’ of Current Audio Magazine including the disputed material from the Elvis Presley press conference of June 9, 1972 and that defendant has no proprietary interest therein as against plaintiffs.